A group of scientists claim to have finally concluded what ended the Age of the Dinosaurs - an asteroid.The finding of a massive crater at Chicxulub in Mexico's Yucatán Peninsula in 1991 strengthened that hypothesis. The Chicxulub crater is more than 120 miles wide - about the distance from Fairbanks to the Arctic Circle - and scientists consider it was created when an asteroid more than six miles wide crashed into Earth 65 million years ago. The cataclysmic impact - a million times more influential than the largest nuclear bomb ever tested - triggered massive earthquakes, atmospheric discharge and oceanic upheaval. 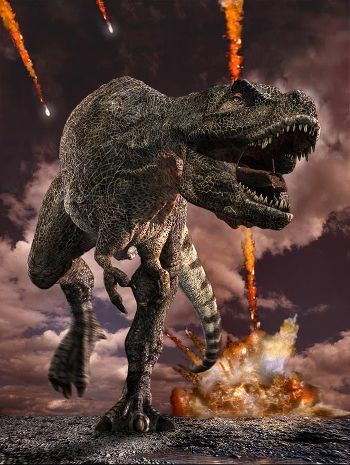 The ensuing mass extinction concluded both the reign of the Dinosaurs and the Cretaceous period, which gave way to the Paleogene period. This theory, having steadily accumulated evidence, was thought to be a close to-consensus view. In recent times, however, in a series of articles, researchers posed an alternate hypothesis for the mass extinction.